Serve with the impact to change lives. Each year we take a trip to Costa Rica to serve with 6:8 Ministries, a local organization in Jacksonville. Interested in joining us? Complete the interest form to receive more information. globalX is Access Church’s international serving division. Our mission is to lead people into a growing relationship with Jesus Christ by serving our international community. We believe when people engage in service, it leads to life change. So we created globalX trips for people to serve together in various locations around the world. Our belief is that, as people choose to serve the impact of that service will change lives. Local volunteering opportunites. For a more comprehensive list go to www.handsonjacksonville.org. Biography: Dreams Come True is an organization that assists in fulfilling dreams for children battling life-threatening illnesses in Northeast Florida and Southeast Georgia. Joy comes to dreamers in many forms: Swimming with dolphins, shopping trips, meeting celebrities, catching blue marlins, or seeing the volcanoes in Hawaii. Having a dream fulfilled gives a child a sense of hope and creates memories of a lifetime for the child and family. Volunteer Opportunities: The brave children battling life-threatening illnesses can only receive one dream. The reality of their serious conditions is that when the dream is fulfilled, the illness and the struggles do not end. For that reason, Dreams Come True developed Special Times. Special Times provides the dream child and his or her family a time to momentarily forget the realities of life-threatening illnesses. It may be dinner at a favorite restaurant, tickets to a Jacksonville Jaguars game, a relaxing evening at the movies, a day of beauty, concert or theater tickets, a gift certificate to a store, new-release DVDs, or even a special holiday or birthday treat. Whatever the opportunity, Special Times reminds the children and their families that they are special and loved. In-kind contributions are welcome. 1. Send an email including contact information to volunteers@dreamscometrue.org. 2. Download the volunteer application. 3. Fill out a volunteer application and a background check. Mission Statement: To serve the homeless and needy by rebuilding their lives through the love and compassion of Jesus Christ. Description: Fully staffed homeless shelter and recovery program. Volunteer Opportunities: Include but are not limited to: Supper Club, Community Closet, donation/thrift store, librarian, and scheduling assistance. 2. Fill out volunteer form. 3. All future volunteers are required to attend an orientation prior to volunteering. Orientation lasts about an hour and includes a tour. Biography: Quigley House is a comprehensive domestic violence and sexual assault center serving the Clay County area in Northeast Florida. Our mission is to provide crisis intervention, temporary shelter, protection, counseling, community education, and prevention programs to stop domestic abuse and adult sexual assault. It takes a community to stop domestic violence. Quigley House will continue to look for better ways of preventing and responding to domestic violence, as the partnership forged between the community and Quigley House offers the promise of serenity to all of Clay County’s residents. What would my volunteer duties be? As a volunteer you can do nearly anything it takes to run a business, run a home, and provide victim advocacy to our clients. You can take training classes to become a Certified Victim Advocate (for adults, children, court advocacy, or on-call weekends), provide counseling as an intern, assist with major projects and fundraising events, and/or provide clerical and computer support. You can volunteer in advertising, landscaping, building maintenance, tutoring children and teaching adult life skills classes, planning activities for shelter clients, collecting donations for our shelter, helping in the Quigley House Thrift Store, serving as a board member or committee member, being an advocate for social, political, and legal change to benefit victims, joining our Speakers’ Bureau, providing community education, and the list goes on and on. We encourage our volunteers to bring their ideas to us as well. 1. Contact the Volunteer Coordinator Jessica Hames (volunteer.quigleyhouse@yahoo.com or 904.579.4057), or link to our volunteer website at www.only4qhvolunteers.viviti.com. 2. Attend volunteer orientation. Plan to spend a couple of hours learning the basics of volunteering in a domestic violence and sexual assault shelter. A comprehensive volunteer information packet will be given to you, which includes your volunteer application. Biography: Builders Care is a not-for-profit community-based construction organization whose mission is to provide home improvements, particularly to aid our senior and disabled citizens to function more safely in their own homes. We renovate homes, making them more accessible including bath and kitchen modifications, wheelchair ramps, fall protection, and ease of traffic flow for wheelchairs. To Volunteer: Contact Dave Vartanian at 904.716.3446. Biography: The Defender Foundation wants to be involved in ending human trafficking—to prevent, provide, raise awareness, prosecute, and support other NGOs and agencies involved in human trafficking. We do all of this through volunteer-oriented membership. Prevent: Educating organizations, ministries, and education systems who have local and/or overseas impact. These organizations will educate the sources where victims are cultivated. Provide: 24-hour victim transport and tip line for victims. Statewide pickup service. Connect the victims with care-provider agencies. Law enforcement and follow‐up services. Raise Awareness: Raise awareness through written and visual media, support other NGOs, and educate membership base. Prosecute: Our goal is that every rescue results in a prosecution. We will connect the victims to all relevant law-enforcement agencies and seek to gain the victim’s trust. We want heir testimonies to result in prosecution of human traffickers and those who would buy, sell, or sexually exploit the victims. Volunteer Opportunities: Help educate and raise awareness. Put together a duffel bag of items that will be given to the victims upon pickup. Volunteer for hotline for when phone calls come in. Make survival bracelets. Hand out brochures at key events. participate in fundraising events. To Volunteer: Contact Erin Pruett at erinp@thedefenderfoundation.org or 904.874.2792. Biography: Take Stock in Children was established in 1995 as a non-profit organization in Florida that provides a unique opportunity for low-income and at-risk students, many from minority families, to escape the cycle of poverty through education. We offer our students college scholarships, caring volunteer mentors, and hope for a better life. Our comprehensive services start in middle school, continue through high school, and include transition into college. Volunteer Opportunities: Become a Take Stock in Children mentor. Mentoring sessions range from 45-60 minutes and occur at a school near your home or workplace during school hours. The days and times of mentoring sessions are arranged between the mentor and mentee depending on their individual schedules and classes. As a result, mentoring is convenient for both students and mentors. 2. Fill out a mentor application. 3. Contact Alyse Saylor, mentor recruiter, at asaylor@cisjax.org or 904.338.9096. Be Rich is one of our favorite times of the year at Access! It’s our annual holiday giving-and-serving campaign. It started in 2007, and it’s a joint campaign with North Point Ministries and all the North Point Strategic Partners. 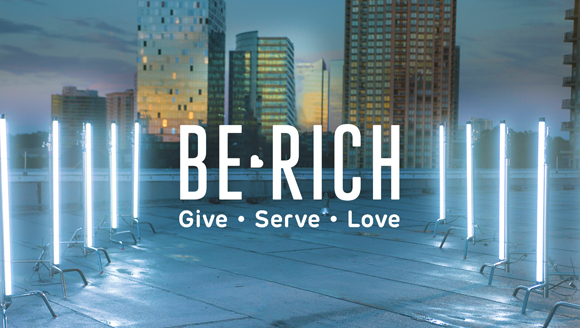 Be Rich includes three specific opportunities: Give, Serve, and Love.